WITH all eyes on Iran and North Korea (rightfully so), Erdogan, Turkey’s AK Party leader – deeply tied to the Brotherhood Mafia – is working feverishly to cement the nation into a full-blown Islamic juggernaut, once again. EVER since Erdogan’s ascension in 2003 as Turkey’s top dog, the nation has been moving towards its ultimate aim, that is, the resurrection of the Ottoman Empire which was destroyed in 1924 as the last Sunni Islamic Caliphate. But it must be understood: for centuries, the hegemonic struggle within the ummah has been intra Sunni and inter Sunni and Shia, and nothing has changed. MORE specifically, Sunni and Shia strongmen will, temporarily, shelve their warfare for exigent circumstances, especially, when it comes to destroying infidel nations. Most tellingly, Iran’s Shia terrorists were deeply collaborative with Sunni regimes in their prep for 9/11/01 (and in their escape thereof), although Saudi Arabia’s Sunni terrorists took the lead. Of this there is no doubt. “The Secret History Of The Iraq War” (and related credible and corrobative sources) tells the devastating tale. STILL yet, for further edification and disinfectant re where Turkey stands (vis-à-vis the west), the following excerpts from a blockbuster interview, ” The Muslim Brotherhood’s Quest For Global Dominance – An Interview With Adina Kutnicki ” (October 28, 2013), sets the stage. Wolff Bachner: Ever since Turkish Prime Minister Erdogan came to power in 2003, Turkey has slowly evolved from a secular state to a religious theocracy based on Sharia Law and Islam. Erdogan has taken every opportunity to undo decades of good relations with Israel while supporting Hamas and Jihad. What is going on in Turkey and what is Erdogan’s endgame? Adina Kutnicki: In answer to the all important question of Turkey, its position as a so-called “moderate” Muslim nation and its relationship to Israel, a brief backgrounder is in order. Turkey has enjoyed a “pet” relationship within the west, ever since its membership in NATO began in 1952. And, while the honeymoon lasted a little over 50 years, not too long after Prime Minister Recep Erdogan took over the helm, in March 2003, as Turkey’s 25th PM, the government’s Islamist agenda (from a secular leaning/tolerant nation) reared its head. Their volte face was not done in rapid moves, but akin to the precepts of Stealth Jihad – incrementally, phase by phase. It is essential to acknowledge that PM Erdogan is a devoted and dedicated leader of the Muslim Brotherhood, as elucidated at Aina.org. He is also President Obama’s BFF, and this is no secret. Indeed, it is more than instructive to view their relationship in global terms, particularly since the rise of Islamism throughout Turkey merges with its entrenchment within Washington’s corridors. As such, a perfect storm. A union for Allah……. Very little is known, at least to westerners, about a specific Muslim Brotherhood-backed Islamic project – the Turkish-Islamic Union. While Shiite leadership and most Sunni heads are not on board, the fact of the matter is that Turkish rulers envision themselves astride the resurrected Caliphate via a reconstituted Ottoman Empire. Assuredly, they are marching full charge ahead. And, for an overview of the Turkish-Islamic Union, peer within. See if you’re convinced of their altruistic, affirmative messages of love and more love to non-Muslims. They are pejoratively, religiously deemed “infidels” and special animus is reserved for the most reviled, the “Joos”. Let’s call an ace an ace, a spade a spade…..continue here…. INDEED, let the above serve as a foretaste….a foreshadowing….a forewarning. THAT being established, what else is going on with Erdogan, but this time via Turkey’s Eurabian Partners? Enter, “Islamophobia.” It is the ever-ready, handy bugaboo (its invented origin is murky…some claim Iran’s Islamists coined it, others lay it at the Brotherhood Mafia’s feet….six of one, half a dozen of another) which is used to bludgeon non-Muslims into silence and submission – re any criticism of Islam akin to the dictates of Sharia (Blasphemy) Law. Got that?? YES, who better than Islam-centric, bowed Euro leaders to cow-tow to Erdogan? Rhetorical. Turkey, a member of NATO along with the United States, for years was regarded as a moderate Muslim nation with Western leanings. But it recently has taken a sharp turn toward full-blown Islamic law and persecution of non-Muslims. It just got worse, with a statement from a high government official that Turkey wants all governments across Europe to criminalize “Islamophobia,” which would include any negative comment about the religion. The report comes from Uzay Bulut, a journalist from Turkey who has worked with the Haym Salomon Center. She’s currently based in Washington and writes at the Gatestone Institute. There is nothing new about his views, the report said. The writer suggested that Turkish officials be reminded of the nation’s history. Protestant Christians are not considered a “legal entity” in Turkey and are deprived of the right to establish and maintain places of worship. It’s actually been since about the 11th century that Turks “seem to have had a tradition … of being unneighborly to non-Muslims,” she wrote. “The West needs to be reminded that this tradition is alive and well in modern Turkey,” she said….continue reading…. NOW, what does all of this have to do with America’s leaders? Everything. FOR all practical purposes (and under successive U.S. administrations alike), Washington has gone along with Turkey’s dangerous and duplicitous double game – its “one foot in, one foot out” Islamic-western two-step shuffle. Which brings us to Turkey’s Brotherhood “made man”, Erdogan. Alas, regardless of the media’s spin that he is sparring with HUSSEIN, he is one of his BFF’s. 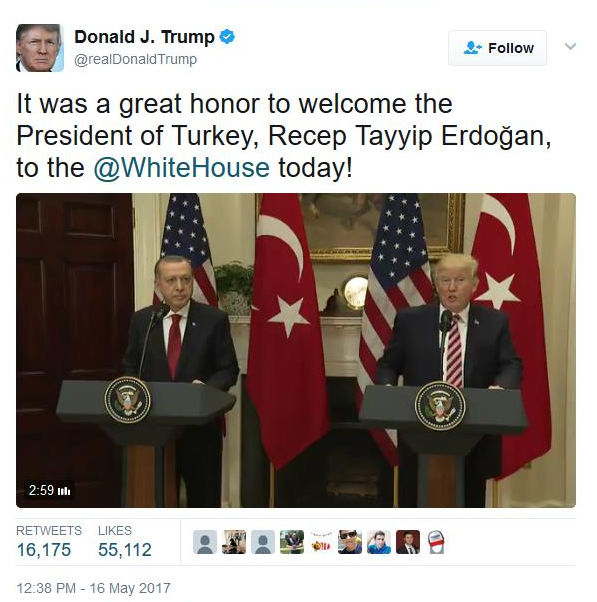 Incontestably, as recently as April 2016, they gathered at Turkey’s 100 mil plus MEGA mosque opening in Lanham, Maryland. Mind you, this Brotherhood mobbed up behemoth is in the shadow of America’s Capitol in Washington, DC, in fact, a mere 13 miles away! Did you ever? For the record, it is the largest mosque (aka Islamic “cultural” center) in the western hemisphere. G-d have mercy. To wit, does this sound like a fractured relationship between Brothers?? Come on. In line with the above, bear in mind several intersecting factors. In so doing, the seemingly mind-boggling geo-political dots will start to fall into place. Wait and see…..continue reading…..
ALL of which has landed at President Trump’s doorstep, yet little has changed. Hmm. STILL, there is some hope that a volte face will transpire. Previously, without the benefit of “proper counsel”, that is, before Pompeo and Bolton entered the top slots at State and National Security, respectively, prior handling re Turkey’s Islamic face (even though having NATO status since 1952), more than likely, was akin to a slap on the wrist to a wayward family member – just be a good boy! THE point being: if Erdogan succeeds in convincing his Eurabian (NATO aligned) Partners to criminalize “Islamophobia”, in both word and deed, the entire EU will become fully Sharia compliant, thus, placing a nail in the coffin of free speech! IN plain-speak, what, if anything, will America have in common with the EU, let alone with Caliphate-driven Turkey? Inextricably, under Erdogan’s hands, Turkey is already at war with everything the U.S. stands for. However, the leadership realizes they are no match for America’s strength on the battlefield. ON the other hand, they recognize America’s Achilles heel – PC censorship is indeed on tap! In the offing. The opening event was also attended by the leaders of two U.S. Muslim Brotherhood affiliates. The mega-mosque “will likely become the largest and most striking examples of Islamic architecture in the western hemisphere” when it is finished, according to the Muslim Link. In his remarks May 15, Erdogan said he would return for the opening ceremony next week. He also warned against “Islamophobia,” branding potential critics as paranoid bigots. Erdogan recently stated that “Islamophobia” and Zionism are equivalent to fascism and anti-Semitism, saying they are a “crime against humanity,” according to the Clarion Project. On U.S. trip, Erdogan brought with him the father of one of the Islamists killed on a Turkish flotilla that was trying to break Israel’s weapons blockade of Gaza. Gaza is controlled by Hamas, a designated terrorist organization by the U.S. State Department. This entry was posted in Uncategorized and tagged Brotherhood Mafia, Erdogan-Turkey's AK Party leader, Eurabian Partners, Islamophobia, resurrected Caliphate, Sharia (Blasphemy) Law, The Muslim Brotherhood's Quest For Global Dominance by Adina Kutnicki. Bookmark the permalink.